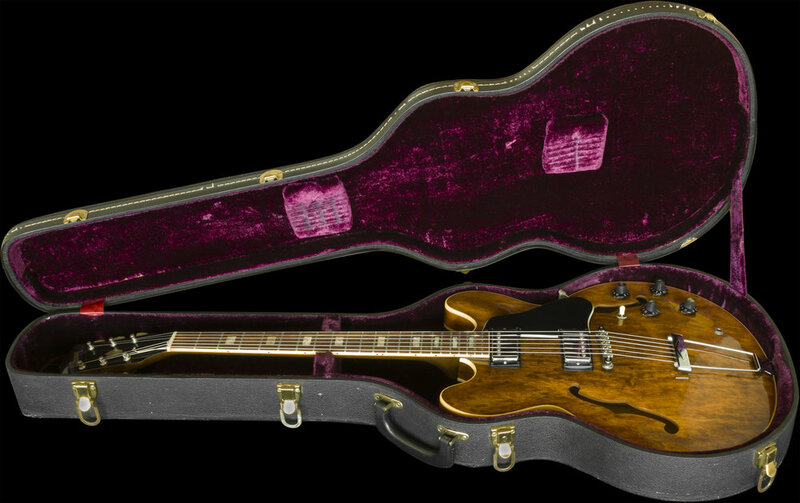 ES-335TD model guitars have been popular since Gibson introduced them to the world back in 1958. Like many guitar models, they seem to enjoy popularity spurts and trends that can last a decade or more. I have also seen them fade away from the public's interest only to reemerge again years later. This model has never been discontinued from Gibson's product line and seems to be enjoying another popularity wave today, which is likely due to Gibson's many offerings in the form of standard production models, reissue versions, as well as custom and artist signature models too and they generally seem to do well in sales. 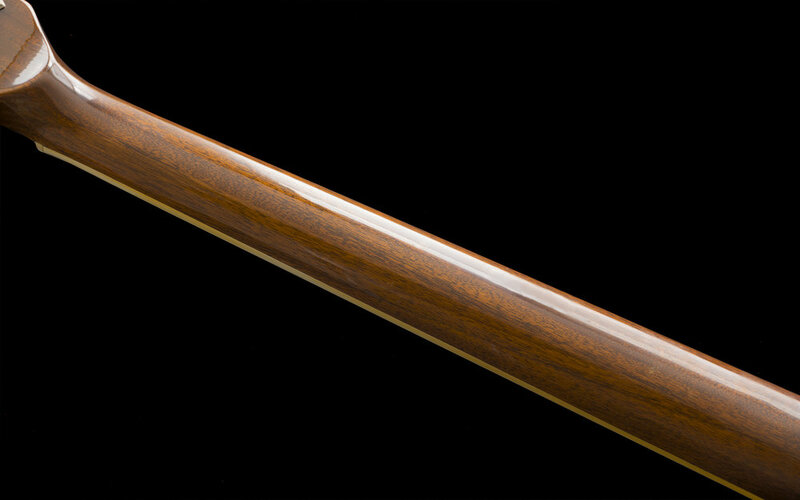 The WALNUT color option for this and other Gibson models, which became very popular during the 1970's, was introduced in 1968, which was about the same time that Norlin took the helm running Gibson. I have examined, tested, serviced and set-up this instrument and found it to be factory-correct and generally unmolested. When I procured the guitar, a previous owner had installed a replacement set of mid 80's Gibson tuners, they made no additional screw holes but utilized the locking top washers and those have left light impressions in the face of the headstock but they are minor and difficult to see. I mention this as I offer full known disclosures of all of my instruments. All of the electronics, frets, nut, finish and both the plastic and chrome plated metal hardware are all Correct and Original to the guitar. The guitar has the appearance of having been lightly played long ago, it displays very minimal and minor evidence of this but there is really nothing to specifically notate. There are many small marks, dings and normal signs of wear globally, but there are no major flaws or damage. The frets are in very good condition and the guitar feels good to me and is working well in every way. The CASE is correct and Original to the guitar and is Very Good Condition with a functioning handle, latches and hinges, all are present and working well. The guitar has just been set up with a set of D'addario XL 10 - 46 gauge strings. When I began collecting guitars, my main interest was Electric Guitars and Basses, and I focused on the earlier models from the 1950's and 60's. After my store had been up and running for a couple of years, I began to encounter and handle more Fender and Gibson instruments from the 1970's and I began to develop an appreciation for them. After CBS eventually took over all aspects of production at Fender, ironically, Norlin did the same at Gibson at just about the exact time period, so the instruments all changed, and as many of us know, not really for the better! There was an effort by these large multi-brand companies to increase profits by reducing material and labor costs as well as decreasing the production times of the instruments, and generally, the products suffered. As time went on, I began to encounter these 1970's instruments more frequently and through handling them, I began to like and collect them. Whenever a nice example came across my path, especially clean and original specimens, I started to keep some of them and I ultimately amassed a various collection of them. This ES-335 is one of those guitars. The guitar is now 44 years old and has been in my collection since purchasing it 25 years ago and it has been spared all of the "circulation" that most vintage instruments being offered online today have undergone. The 1970's model instruments live in the more affordable price ranges of Vintage guitars and many are viable, usable and fun instruments to both play and collect. Kindly inquire.